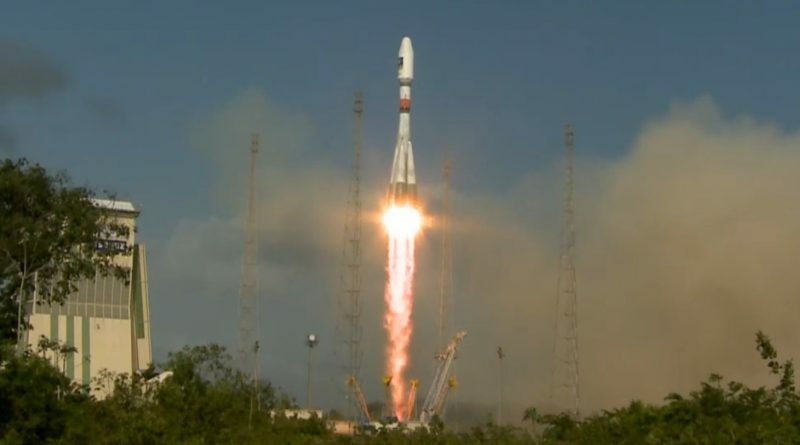 Russia’s Soyuz workhorse launch vehicle blasted off from its tropical launch site in French Guiana on Thursday at 11:51 UTC, embarking on a mission to deliver the 11th and 12th satellites in the Galileo satellite navigation system to orbit. 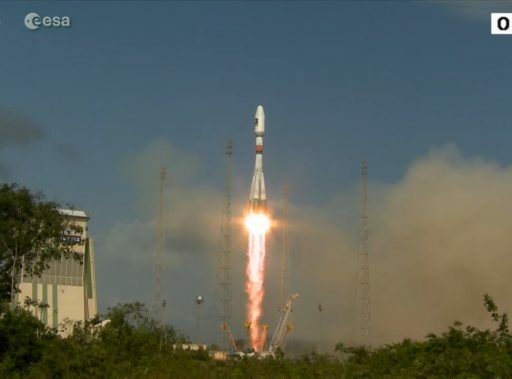 Aiming for a Medium Earth Orbit, Soyuz swung to the north east and provided the satellites with a smooth nine-and-a-half-minute ride into a sub-orbital trajectory from where the Fregat Upper Stage assumed control of the flight. Fregat completed its first lengthy main engine burn immediately after separation and then entered a coast of three hours and 15 minutes to set up for a critical circularization maneuver. Spacecraft separation into an orbit of 23,222 Kilometers is planned three hours and 48 minutes after liftoff, 15:39 UTC. Heading into an eight-hour countdown, Soyuz 2-1B and the two 717-Kilogram satellites entered final testing while teams completed the last hands-on work at the pad. 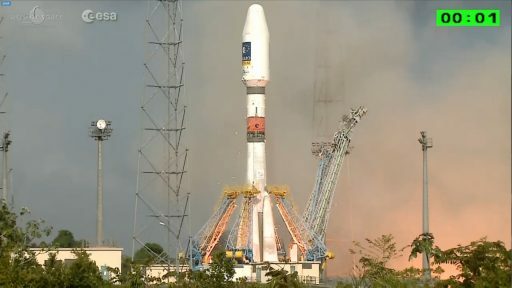 Starting four hours prior to liftoff, the Soyuz rocket was filled with 274 metric tons of Liquid Oxygen and Kerosene propellants before being revealed atop its launch pad when the Mobile Service Gantry was retracted. Over the last minutes of the countdown, the Soyuz pressurized its tanks, switched to onboard power and started its own launch sequencer, leading up to the ignition of the engines. 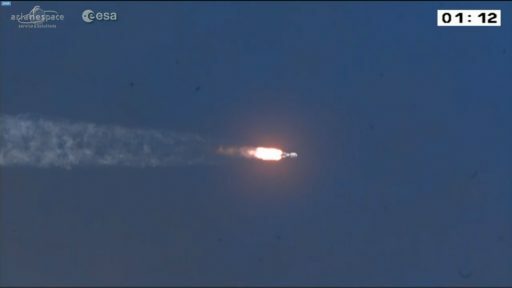 Soyuz lifted off at precisely 11:51:56 UTC and climbed vertically with a thrust of 422 metric-ton-force before pitching and rolling to attain a precise ascent trajectory to the north east for a fast flight across the Atlantic Ocean. The four boosters fired for the first two minutes of the flight, delivering the thrust necessary to get the Soyuz off the ground and on its way to orbit. 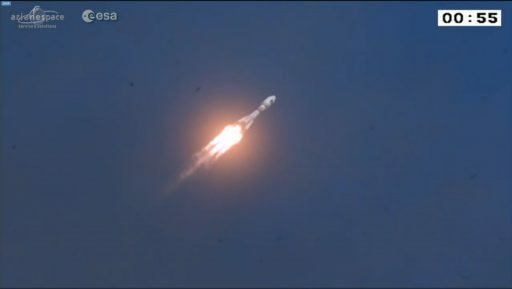 Shutting down their engines, the boosters made a clean separation and left the Soyuz powered by its Core Stage alone, supplying plenty of thrust to carry the vehicle out of the atmosphere for the separation of the payload fairing three and a half minutes after liftoff. Soyuz went through hot staging four minutes and 45 seconds after launch as the third stage took over to deliver 30 metric ton-force of thrust for the next four and a half minutes. Soyuz performed flawlessly, delivering the Fregat Upper stage to a sub-orbital trajectory from where the stage started controlling the flight. Tasked with two main engine burns, the Fregat Upper Stage ignited one minute after separation on its first burn, a long 13-minute firing to enter an elliptical transfer orbit with an apogee over 23,000 Kilometers. The first burn was completed on time and Fregat entered a coast phase of three hours and 15 minutes to climb all the way up to apogee so that the second burn can bring up the perigee and circularize the orbit. The second main engine burn of the Fregat upper stage is expected to commence three hours and 38 minutes into the mission and last four minutes and 22 seconds. The two Galileo satellites are targeting a circular orbit at 23,222 Kilometers, inclined 54.95 degrees. Spacecraft separation is expected three hours, 47 minutes and 57 seconds after launch as the two satellites are pushed away from the payload adapter at the same moment, heading off into different directions to begin their long missions.